If you are like most of us, each year as the calendar rolls to December, we start to take the holiday season a bit more seriously. We start searching for perfect gift ideas for everyone on our list, even for those in the “hard to please” and the “already has everything” categories. Gift giving can be additionally tricky if you live some distance apart from your recipient, or if you need to come up with a corporate gift for a work colleague or business associate. And none of us wants to go into debt completing the list! Gift baskets are a perfect choice on so many levels. 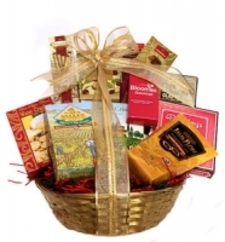 Everyone loves to unwrap basket and sift delightedly through the unexpected goodies within. 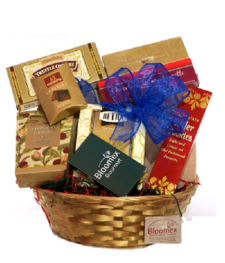 Bloomex is your go-to resource for excellent Christmas and holiday gift baskets for everyone on your list. We’ve put together some amazing choices, at some of the best prices in town, with a wide array of tastes and interests in mind. We also offer fast delivery that gives you peace of mind, knowing that everyone on your list is taken care of this year. We’ve selected a few of the highlights for you here, but be sure to check Bloomex for the full range. Happy shopping: your list will be completed in no time! 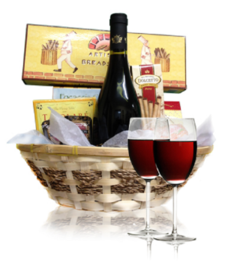 There are many gift baskets to choose from that contain wonderful bottles of red or white wine, or even champagne. Shown here: A Red Wine and Cheese basket beautifully presented with red wine, and gourmet treats such as cheese straws, gouda cheese bels, crackers and breadsticks is a sure winner. Click to see more Wine and Champagne gift hampers. Who doesn’t love diving into some delectable, mouth-watering chocolate, chewy cookies, or tasty candies? Anyone with a sweet tooth is sure to adore a lovely basket chock full of tasty and tempting treats. Shown here: A Holiday Tradition I Gift Basket combines the best of both worlds when it comes to indulgence, including a variety of cookies and candies for your happy recipient to savour. Click to see more Sweets Baskets. For anyone who loves to enjoy savory snacks, sending a gift basket full of gourmet treats is a sure bet. These baskets contain a variety of gourmet items such as cheeses, seafood, crackers, breadsticks, and other high-end items they are sure to enjoy. Shown here: Snack Lover Gift Basket. Click to see more Snack Baskets. For the beer lover on you list, Bloomex has you covered! Send them a gift basket containing a favourite beer, from a creative Car Wash Basket, to a BBQ basket, to a snack basket that includes nibblies such as chips, crackers, or candies. Shown here: A Beer and Nuts Basket provides a variety of tastes to enjoy. 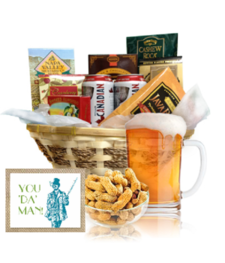 Click to see more Beer Baskets and other Baskets for Men. For those on your list who prefer a delicious and more nutricious choice of snack, a wonderful, fresh fruit hamper is the way to go! Send some holiday wishes with the gift of a tempting variety of the day’s freshest fruits. 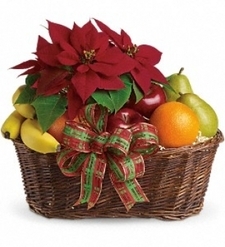 Shown here: A Poinsettia and Fruit Basket is perfect for the holidays! 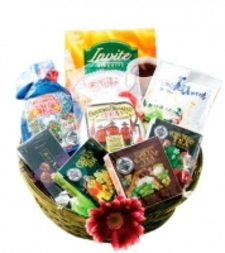 It contains a mouth-watering assortment of premium fruits, attractively packaged with beautiful poinsettia. What a wonderful holiday gift! Click to view more fresh Fruit Baskets. For anyone who enjoys a good cup of java, or a "cuppa tea", we have premium gift baskets featuring wonderful samplings that they are sure to sip, savour and enjoy! Shown here: A Tea Sampler Basket contains a balanced assortment of gourmet teas and treats that is sure to delight and impress. Click to see more Coffee Baskets.Click to see more Tea Baskets. 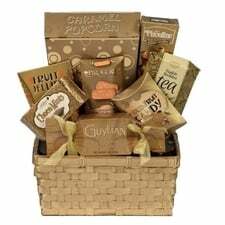 To send a thank you or a courtesy gift to a work colleague or a business, choose an attractively packaged gift hamper that contains a nice, well-rounded selection of tasteful treats. You can’t go wrong with one of the Christmas Gourmet Collection or Holiday Tradtion baskets from Bloomex, : Shown here: the Holiday Tradition III Gift Basket contains the perfect array of gourmet snacks and treats, for a truly amazing price. This basket lets you look like a big spender even though you saved, which is always a smart move! Click to view more Corporate Gift Baskets.